Plugin...Recharge! : EV Charging Station "Levels"
To the National Electrical Code, charging stations for electric vehicles fall into three distinct Level (or types). When the rubber hits the road, these Levels really describe how much power you can supply to the vehicle you are charging...the more power you can deliver, the faster the charge...and vice versa. Direct Current charge in US/Japan. SAE standard coming in 2012. 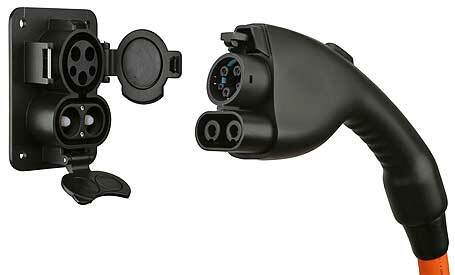 CHAdeMO is the Japanese spec which is supported by several automakers. hours to fully charge a vehicle. The biggest advantage to Level 1 is that you can find service almost anywhere in the US and since the charging current is about the same as a standard blow dryer, it won't put too much of a burden on your existing electrical service. Obviously, the biggest disadvantage is the length of time it takes to recharge a vehicle. Level 2 increases the charge power by 5x and decreases the typical full charge time down to 4-8 hours, thus the main advantage for Level 2 Charging is speed. The disadvantage of charging something faster is managing the heat that is produced in the battery through the charging process. Although today's EV's are built to manage this heat (using liquid cooling/fans), heat typically shortens battery life. Level 2 charging will be the normal charging service that we will be using in the future. The Society of Automotive Engineers has approved a new standard plug called SAE J1772 which will be the "gas hose" that new EV/PHEVs will use. Level 3, or Fast Charging, requires very high levels of voltage and current, but the big advantage is speed. Some vehicles can charge in as little as 15 minutes, but it all depends on the battery type and chemistry...as charging this fast makes a HUGE amount heat that has to be disposed of quickly. Level 3 Charging is perfect for: fleets that need frequent recharges during the day; anyone traveling cross-country trips; and emergency charging in case of evacuation. Unlike Level 1 & 2 chargers which output AC to the vehicle, Level 3 chargers typically output DC using a different plug than the J1772. The CHAdoMO plug specification is used in several Japanese cars including the Nissan Leaf. The SAE is set to decide on a J1772 Combo Connector (a.k.a. FrankenPlug) which combines the current J1772 and high power (90kW) DC charging in one plug. This creates a US Standard for Level 3 and saves automakers from installing two connectors/filler doors on a car. You'll only see this plug on future Level 3 chargers. You can read about it here. Level 2 - a 3/4 inch garden hose - not much bigger, but lots more flow. Level 3 - a 3 inch Fire Hose with a big red truck behind it! If I am building a new power plant which produces electricity using renewable sources, and build a level 3 charging station using next to it, and my goal is to send the excess electricity into the grid, then what infrastructure would I need? Level 3 charging stations are in VERY early stage of development now, so if you're set on offering Level 3 charging, I would recommend installing wiring capable of 400A to the location you want the charging station and waiting for the chargers to mature (which will likely be in 2011 at the earliest). As far as I know, only eTec and AeroVironment have level 3 charging experience, so I would watch them the closest. I think a better strategy would be to plan to install multiple Level 2 (220v) charge stations when charging station manufacturers start releasing models with the new "filler plug" (J1772)...which should be available around Q2 this year. There are several new startup companies that will be offering these chargers with integrated advertising and billing...so you will have a much larger choice with a lower price (~$2500). When I am charging a lot of power would be needed in a short time. Will I be needing any power storage equipment, such as batteries for this purpose? Or else, what would I need? Sorry if you are not acquainted with the electrical stuff. I am a student in NY doing a related project. There are a ton of big variables to a project of this size...and to my knowledge...it's never been done before. You need to start with requirements, including: how many chargers, what type, how much power can you source constant and peak, is it grid tied, where located (plant and chargers), distribution needs, and especially who will use it, how often, who's going to pay for it...way too much to talk about in a comment field in a blog. The main challenge to this project is the "peakyness" of the level 3 charging demand...so I'd define the need/demand first and work backwards to defining the source. If your target RE source is Solar, you should check out NREL's SAM modeling tool to help you figure out the size and scale of the powerplant. You can email me via my profile if you want to discuss further. I am wondering if there is a reference to know what the pricing for a new residential Level II charging station should be. Most of the dealers I find online do not list prices. These dealer http://webosolar.com/store/en/85-ev-charging-stations show prices but IMO they are overpriced. Then you have places like Home Depot where the stations they advertise are not available. I am having a hard time figuring out what is a fair price to pay and where to buy. Plugin...Recharge covers the electrifying subject of the Charging Infrastructure for EVs/PHEVs. There is no better way for each of us to reduce GHG emissions and reduce our dependence on foreign oil than switching to an EV (short of not owning a car). Viva la (electric car) Revolution! © 2009 Plugin...Recharge! · Proudly powered by Blogger & Green Park 2 by Cordobo.